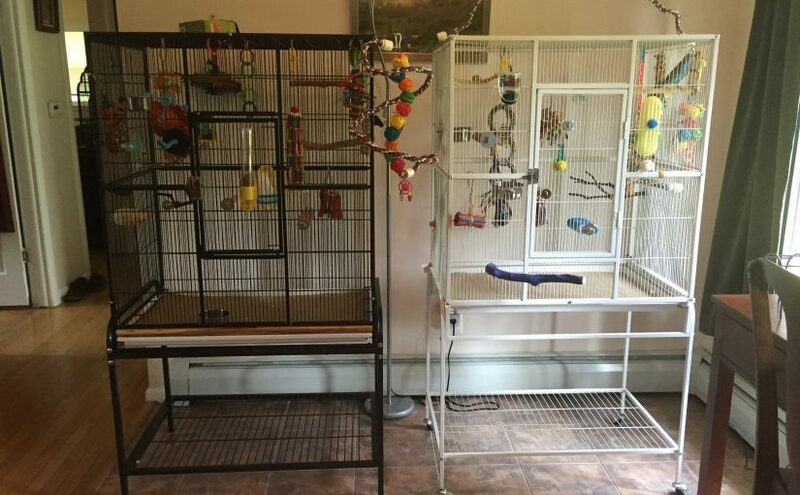 I didn’t think this would ever happen, but we’ve side-lined my previously favorite cage, the HQ Victorian Top, in favor of a second flight cage for Kelly. 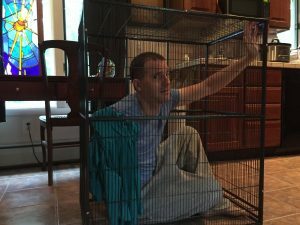 We had purchased the Prevue Flight Cage a few weeks ago for Toby, but always intended to leave Kelly in the old cage. Here’s what changed our minds. The flat top of the Prevue Flight Cage – we hadn’t realized how much we missed that with the Victorian top cage. It is so convenient to serve treats on top of a cage, or offer a bath up there, and they just love running around on the surface of the cages. Patrick even installed a neat Booda Comfy Perch bridge on top of the cage, which they get enjoyment out of every day. There was a downside though, using the Prevue Flight Cage top so much we found that it wasn’t very sturdy or flat but tended to want to bow inward. I guess that’s what you get at that price point, but it was a little disappointing. I also ended up not loving the white finish, it’s easy to clean, but I think it chips more easily. Another great thing about a traditional flight cage is the ability to hang things from any point in the ceiling of the cage. With the HQ Victorian Top you couldn’t hang much from the top doors, which left you with very little ceiling space left. And the shape of it in general encouraged short flights, but even though it was large the usable space was really diminished by the decorative shape. The traditional flight cage is also easier to clean than the HQ Victorian due to the lack of rounded edges that create small, hard to get into spaces. Anyway, we popped in at a local pet store and were checking out their selection of cages. We saw this A&E flight cage in black and were immediately in love with the size, the color and most importantly, the overall quality. It didn’t have the cheap, bendable feel of the Prevue Flight Cage . We went back the next week and snapped it up, not even realizing that buying in store meant we would be purchasing an already assembled cage, instead of spending another several hours putting it together ourselves. It did, however, mean that the cage needed to be thoroughly cleaned, because it had been on the sales floor. Some White Vinegar and elbow grease made quick work of the dirt and we were quickly ready to load it up with toys and get Kelly settled in. I’m nervous about her spending the night in there, she is not very adaptable to change, but for now we just moved everything over from her old cage and put it exactly where it had been. Hopefully that and the fact that it’s in the same spot and the same color that the old one was will help her adjust. The best part is that when we get our boy bird in November he can move in with whichever lady he gets along with. Or maybe if he eases up the tension they can all live in the new flight cage. AND, now I don’t have to worry about quarantining the new guy in an inappropriately small cage, he can live in the HQ Victorian Top while he quarantines in my office space. Here’s a good indicator of just how roomy this new cage is! 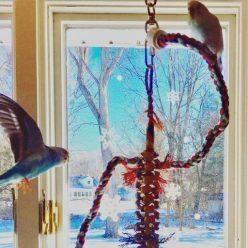 Next Next post: Parakeets and nail polish – what are the dangers?